The folk super group Twin Forks - comprised of members from The Narrative, Bad Books and Dashboard Confessional - may have only started playing shows early this year, but that didn’t stop them from drawing excited fans to their South by South West (SXSW) showcases at this year’s festival. With one single up on their Facebook page and the help of word of mouth, the quartet made their way to Austin to promote the side project, and judging by the crowd response, they did a pretty good job. 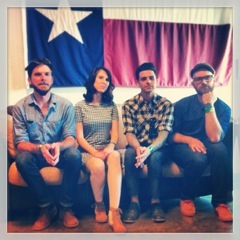 With five shows scheduled over the course of four days, Twin Forks most certainly kept themselves busy, but that didn’t stop them from finding some time between sets to sit down with us to discuss the project, SXSW and when fans can hope to get their hands on the group’s debut album. Alter The Press: To start off, I just wanted to say that the show was amazing! Suzie Zeldin (vocals/mandolin): Thank you! ATP: Now, this wasn’t the first SXSW show for you guys this week, so how has the crowd response been? Chris: The crowd response has been amazing, considering nobody knows our music at all. They’re coming out on blind trust and by the end of it they’re figuring out how to sing along to songs they don’t know, clapping and being exuberant. It’s just been amazing! ATP: So the fans of your current bands have been taking well to it? Suzie: Yeah, definitely! We’ve had some The Narrative fans out at the shows and people have been talking about Dashboard Confessional and Bad Books. It’s just really awesome to have such a supportive group with us. ATP: Since you guys are from different bands, what brought you together for this project? Jonathan Clark (vocals/bass): Yeah, basically! Ben: Yeah, that’s basically it. ATP: Well, good job, fate! Now, I have to ask, what was it you were looking forward to most at SXSW? Suzie: Playing live in front of people. Chris: Yeah, honestly, just playing live. You know, we’re music fans just like anybody else and we wanna see every show we can but we’re so excited about playing together in front of people. We’ve been playing together in front of no one for so long now that to finally be out in front of people makes this so exciting. ATP: And what are you guys doing after this? Finishing up the album and then touring? Chris: We’re touring before the album even comes out for sure. We’re booking tours now. Suzie: Yeah, so we’ll see you! ATP: Yes, so fans, you’ll be hearing about it in the future! Suzie: Yes! If you keep in touch with us on Facebook and Twitter! Check out our Instagram. And we’ll get our website up one of these days, but for now we’re all about social media. Chris: Yeah, everything is at Twin Forks Music. ATP: Speaking of the album, you mentioned during your set that you’re almost done with it. Can you give us any details like how many tracks or when to expect it? Chris: Well, we’ve done like 20 tracks, but that’s too many to put on a record but it’ll be out in the summertime. Early, early summer. Maybe even late spring. ATP: Do you guys have any songs you’ve written that you’re kind of attached to yet? Chris: Of our new stuff? Jonathan: Every single one of them. Chris: Yeah, it’s a little hard to choose when they’re so new. The new-ness makes them so exciting. Some of them will dig their fingernails into us a little deeper over time but right now it just feels like every one of them is like a little bit of freedom. Chris: We’ve all been playing with different bands and doing the same songs over and over now for years so it feels great to be playing something new. ATP: Finally, if you could sum up your band and your sound in three words, what would they be? Chris: I would say, boot stompin’ folk-rock. Chris: No, not with the hyphen!